Your cat(s) need a fresh litter box and you need a fresh smelling house. Keeping your cat's litter box, and your house, clean smelling can be a hard difficult task. When you have cats, you know the difficulty of cleaning litter boxes, and of keeping the rest of your house clear of cat odors and litter. Take a moment to read on and find some helpful tips on doing just that without a lot of hassles. Many of the tips will save you money and embarrassment while keeping your family and your pets healthy and happy. Cats are very clean animals and they like their environment to be clean (not just smelling or looking clean). They like warm comfortable surroundings and they like their food! Cats firmly believe that whatever you are eating or drinking must be better than anything they have and so they will firmly demand to at least have a small taste. (Don’t give in on this one, however, because human food will not only make your cat unhealthily fat, but it could give them severe diarrhea, or, in some extreme cases, cause death.) Cats don’t like their litter to be in the same general vicinity as their food and/or water. In some cases, they may refuse to use the litter box at all and will choose your best satin sheets instead. Cat’s will also not use a dirty litter box and will often find another spot to go--usually one that is very noticeable, like your new couch. Cat's have very distinct personallities and will let you know if they are unhappy with something or if something is wrong--so you might want to pay attention when your cat jumps on the counter and screams at you, he may be trying to tell you there is a stranger in the house! 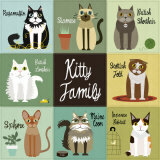 When setting up a litter box for your pet(s), remember that you will need One litter box for Each cat in your house! This is important for several reasons: if a cat is in one box and another cat has to go, well your bed looks fluffy enough to scratch with plenty to cover the waste, right, and you can guess the result. Also, when there is more than one cat in the house, one litter box fills up rather quickly and then the cats are walking on urine and feces when they attempt to go to the bathroom (you wouldn’t want to walk on urine and feces when you go into a bathroom, would you). A full litter box also smells rather quickly and doesn’t clean up well; the more places you have for the cats to go, the easier it is for them to get in a box when the need arises; and the smell isn’t concentrated in one spot (one spot makes the odors stronger and harder to dispense). Plus you will avoid "battles for the potty" when more than one cat has to go. I prefer the covered litter boxes because they control the odor better, less litter is tracked, and you can hide them easily by covering them and using them as a small table. Set a small lamp or an unbreakable pot of flowers on them to 'hide' them from guests. Use scoopable kitty litter (doesn’t matter which brand, they all work about the same-some just smell nicer when you pour or are more or less dusty) because it ends up being cheaper in the long run. You scoop out what is clumped and add a bit more to the box rather than having to change the box every few days. With clay litter, there is no absorption of the liquid and you must clean the box every time you change the litter. Also, to save money, if you can find the scoopable in a bag, it is usually cheaper than the bucket or box-just make sure it says 'scoopable' somewhere on the bag. I usually buy baking soda in bulk at a warehouse type store because I use so much of it with my litter boxes. The cost is a lot at first, but it is well worth it since you usually get enough to use in your boxes for months (depending on how many cats you have) and it comes to just pennies a pound when you work it all out. To use baking soda effectively, clean out the clumps, sprinkle a small amount of baking soda over the top and then add clean litter. As the cats scratch, the baking soda will be mixed with the litter and will help to control odors in between scooping. Feline waste contains bacteria that can be harmful to unborn fetuses, new babies, and young children. If you are pregnant, breast feeding, or have young children that you care for, be sure to use a mask when cleaning the litter boxes and wash your hands and face thoroughly when done. Better yet, have someone else do the dirty work for you. For best results when you are first setting up your litter box--place 1/2” of kitty litter in the bottom of the box, sprinkle a handful of baking soda (break up any lumps), then add an additional 1/4" to 1/2” of litter over the top. Once the box is set up, be sure each and every cat knows where it is located. The best way to do this is to take the cats, one at a time, and set them in the front of the box so they can smell the kitty litter. Once that is accomplished, they will know its location. Yes, each cat needs to know where the new box is because they will all use it at one time or another even if there is a box for each of them. Sometimes they even use the box to put their scent in it as a way of showing ownership or Alpha positions in the cat hierarchy (but that is another Wizz). Cleaning them everyday will remove the feces and urine clumps that have built up. This will help to keep the litter clean so the cats aren't walking on their own waste and fresher smelling for the entire house. In fact, if the box is turned or tucked somewhere, guests may not even know the box is there (unless, of course, a cat recently used it). I find that when I clean my litter boxes, the garbage can I use begins to take on the litter smell, so I switched to a small garbage can that I put used plastic grocery bags in when I clean. Then I tie off the bag, throw it away, sprinkle baking soda in the bottom and replace the bag storing the scoop inside for the next day. The next day, when I go to use the can, it doesn’t smell of used kitty litter, even with the dirty scoop in it. Check the box regularly for areas where the cats may have missed the dirt--in other words the urine or feces has coated the side of the litter box. These areas can be easily cleaned up using wipes (be sure the wipes do not contain anything that might harm the cat), or a damp rag. I find that baby wipes are ideal for these quick clean ups and are mild enough not to harm the animals. Plus, if they are strong enough to clean up baby messes, cat messes are a cinch; well, usually. Just use the scoop to move the majority of the litter out of the way and wipe down the dirty area. Let it dry a moment before tossing the litter back where it was. Litter boxes with scoopable litter only need to be completely cleaned (emptied, washed out, dried and refilled with fresh litter) about once each year (unless you have had a sick cat in which case you should clean it as soon as the cat is better to prevent bacterial infections in the other cats). A good way to clean them is to set them in a tub of HOT water and dish or clothes detergent. Use your toilet brush to scrub them out, rinse and dry with a rag. Be sure to sanitize your tub when you are done or use the brush and hose outside. Remove the cover (where the charcoal filter is supposed to go) and fold a paper towel (or a couple of tissues) to fit the opening. Now sprinkle about a 1/4 cup of baking soda (or whatever will make a layer of about 1/16”) and then cover with another paper towel. Now replace the cover. Tape over the cover and the paper towel to prevent the baking soda from coming out every time one of the cats uses the box. Change this about once every 6 months and your boxes will smell fresher longer. If you notice that your cat’s urine is very strong, try giving them fresher water. Cats need water just as much as you do and if you don’t change it daily (and wash out the container) they won’t drink it as often as they should. This causes their urine to become stronger and will ultimately scent the house with ‘ode to kitty’. If clean water does not help, seek advice from your vet. Strong urine odors can mean serious health issues with your cat. If you notice that the cat’s feces is unusually strong, or that they are often suffering from diarrhea, try changing their food. Often the generic brands will affect cats with weak stomachs and food with a lot of fillers can cause issues. Experiment with small bags of food until you find one that doesn’t cause the family to require gas masks when the cat goes. Dry cat food is best for your cat unless they have teeth issues and can’t chew. Be sure to offer them lots of fresh water though since they won’t get any with dry food like they would with canned food. Rugs often absorb smells from other areas of the house which means they will most certainly absorb the smell of litter boxes especially if one is sitting on it. To combat this: sprinkle baking soda on the rug before placing the litter box down and vacuum the spot at least once a week replacing the baking soda when done. Also, if you sprinkle baking soda on the rest of the rug before vacuuming (let stand about 10 minutes), the rugs will always smell fresh. I noticed that sometimes if the cat box is close to a window the curtains absorb the smell. Try to keep your boxes at least 1 foot away from the curtains if possible. If not, try keeping baking soda (wrapped in cheesecloth) in the bottom hem of the curtains and change it regularly. 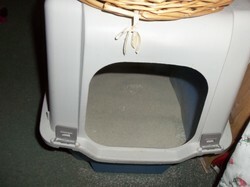 Placing the litter box underneath something that the cat can get into is another way to keep the smell to a minimum. Examples would be a wooden box large enough to hold the litter box with a small opening in one side for the cat to enter and exit--be sure you have a door you can open (or can easily lift the box up) so you can clean it every day. You could also keep the box(es) in a separate room, like the wash room, just make sure the cat can easily get in and out of the room as needed (cat doors work really well in these cases). A small closet, with a cat door installed, can be ideal for cat boxes; however, be sure to clean them every day and be aware that the odor will be stronger in a smaller area like a closet. You might want to invest in a larger litter box. The reason for this is if the cat can’t get in the box completely and comfortably squat to go, you may end up with urine or feces on the floor, rug, or walls. With a larger box, the cat can get in, find a spot, scratch as needed, do their thing and cover it up without missing the box. If a cat misses the box, they might track it through the house without even knowing they are doing it. This can cause serious health issues with the rest of the family. Cats will, inevitably, track kitty litter when they leave any size box. To prevent the litter from making its way too far from the box, use a litter pad, an extra rug, or a pad of some type in front of the litter box opening. That way, when the cat steps out of the box with litter on their paws, the pads of their paws will spread when they step down and the pad or rug will collect the litter preventing it from being tracked further through the house. They might track without knowing. Use a mat or rug. Not only is it important to get the animals fixed so they do not have unwanted babies, but unfixed feline males will spray strong urine to ‘mark’ their territory, and unfixed females will spray strong urine to 'attract' males when they are in heat. Not only is the urine extra strong, but it will be sprayed on household furniture, windows, and doors rather than in the litter box. These smells are nearly impossible to get out of the house once they are there. Getting your animals fixed is, unfortunately, expensive in many cases, but check with your local cat shelters and/or the Humane Society. They can often put you in touch with agencies that will do it for a small donation. Even some of the local vets might be able to help. Also, there are some links below to aid in your search for assistance. As a last resort, try the local dog pound for assistance. To find an animal shelter near you, try this link. Another source you can go to for help. Be careful when using scoopable litter for the first time. Some cats have sensitive sinuses and may inhale the litter thus blocking their nose. This makes it extremely difficult for the animal to breathe and causes massive infections in their sinus passages. This is especially so if the animal is a pure breed or has a smaller nose and sinus passage. If this is the case with your animal, you may have to go to the clay litter or even torn newspapers. The smell can still be controlled with these items if you use baking soda and clean the boxes daily. In order to save money and avoid health issues with your cat, only place enough paper or clay litter to coat the bottom of the box. If you clean it daily, then you keep the smell to a minimum and the cat is still not walking on their own waste. Find your favorite little kitty ornament here to place on your Christmas tree or to give as a gift to a fellow cat lover. Pajamas featuring an ASCII cat. Kitties are such wonderful companions, aren't they? I love mine like they were my own children (and they act like they are as well :) Thanks for stopping by and commenting, Brenda. These are great tips. I hate litter boxes, but I love my two kitties. Flora, nice to see you again, yes mine keep me hopping too, and I'm afraid to tell you how many I have.......but they are all rescues so it was worth it. Thanks for stopping by and commenting. I have only one cat, but she keeps me hopping. She's old, so I focus a lot on what her litter behaviour is to tell me if there is any change. Luckily, she uses it regularly. I remember when she was first here, she didn't need to use it for overa day and that freaked me out.